Being active on social media is a must if you want to reach your audience, engage with them, and build their trust. If you want to make sure they engage with your posts, then sharing catchy posts and images are the best ways to stand out in a social media feed no matter which platform you’re on. Instead of designing social media posts from scratch each and every time, save time with premade social media kits and templates. 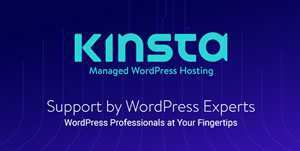 All you have to do is download them, customize them with your colors and fonts, and then upload them to your preferred social media platforms. We also have collections of the best poster templates, flyer templates, business card templates, stationery templates, project proposal templates, and brochure templates. 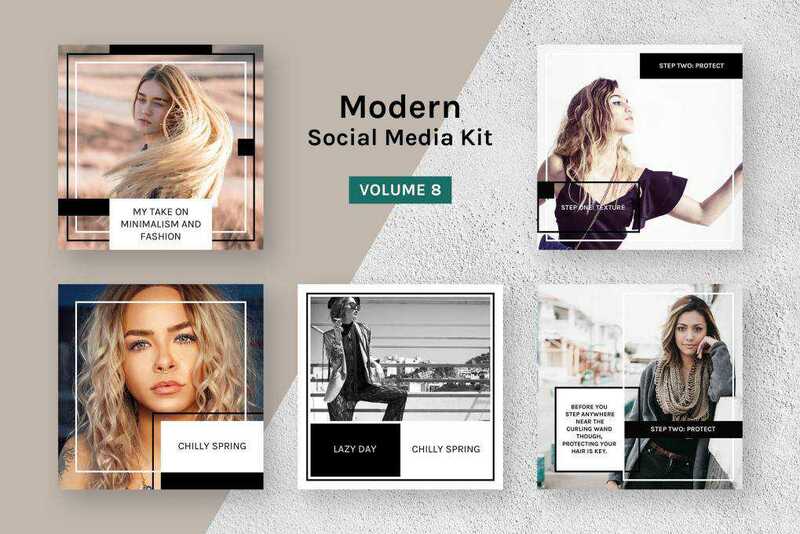 This Modern Social Media Kit is suitable for a feminine brand. They have a stylish design and elegant typography paired with classic black and white color scheme. The kit contains 10 different square layouts for Instagram, Facebook & Twitter. 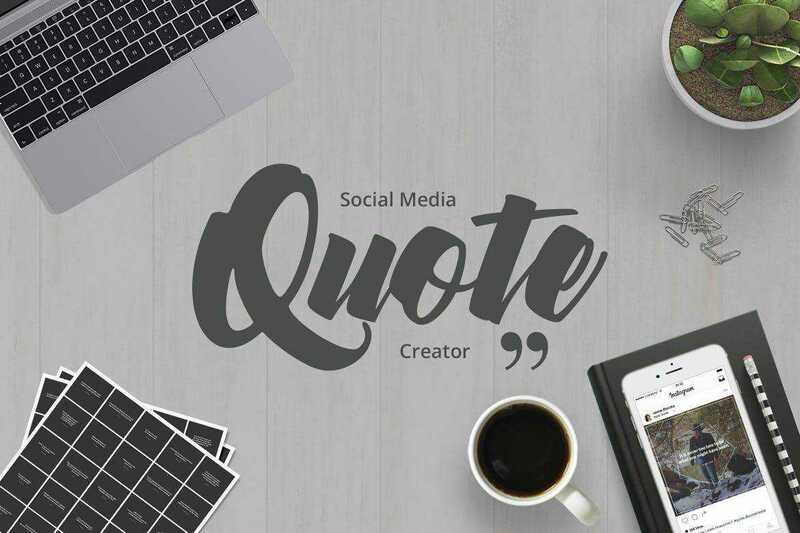 This Social Media Quote Creator is a perfect solution for anyone looking to breathe new life into their social media presence. The template includes more than 200 fonts and a stylish background that will give you attention-grabbing social media quotes in seconds. 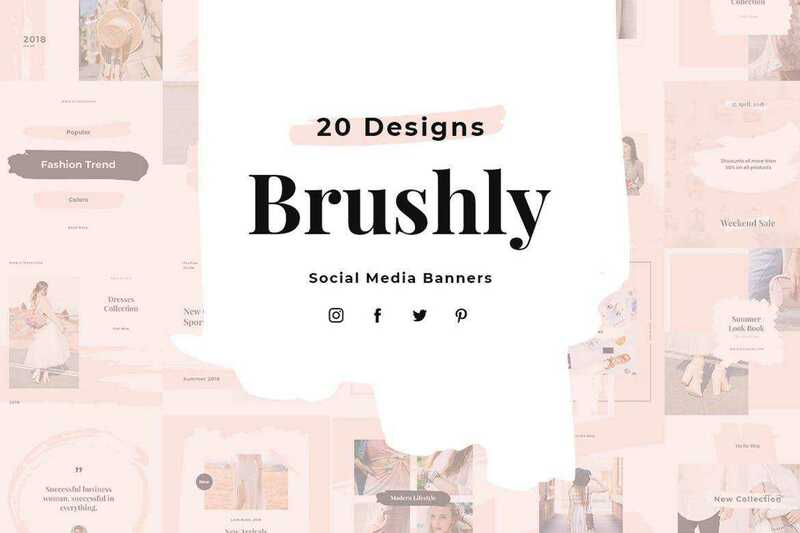 The Brushly Social Media Pack contains 60 stylish and clean social media designs that can be used on Facebook, Instagram, and Twitter. It’s a great choice for fashion or lifestyle brands and it’s easy to change colors, fonts, and images to fit your brand identity. 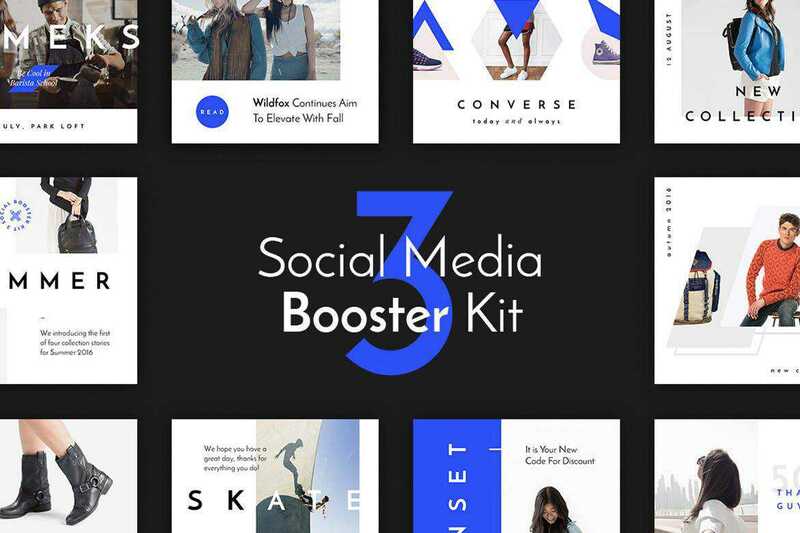 The Social Media Booster Kit includes 15 templates designed for Instagram, Twitter, and Facebook. Each of the templates is easy to edit and customize. This pack is perfect for bloggers, fashion and retail brands. 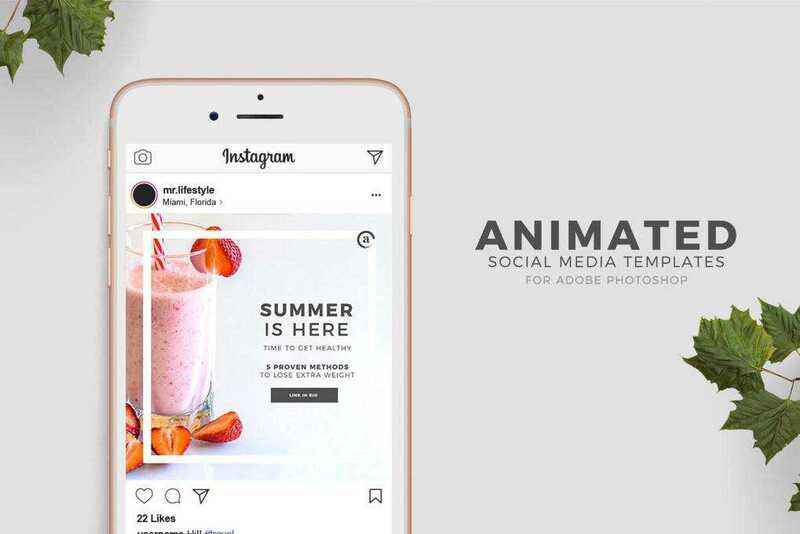 If you truly want to stand out in your followers’ social media feed, consider this set of animated social media templates. You’ll get 10 square layouts that are perfect for Instagram and Facebook and can be used to promote your brand in a creative way. 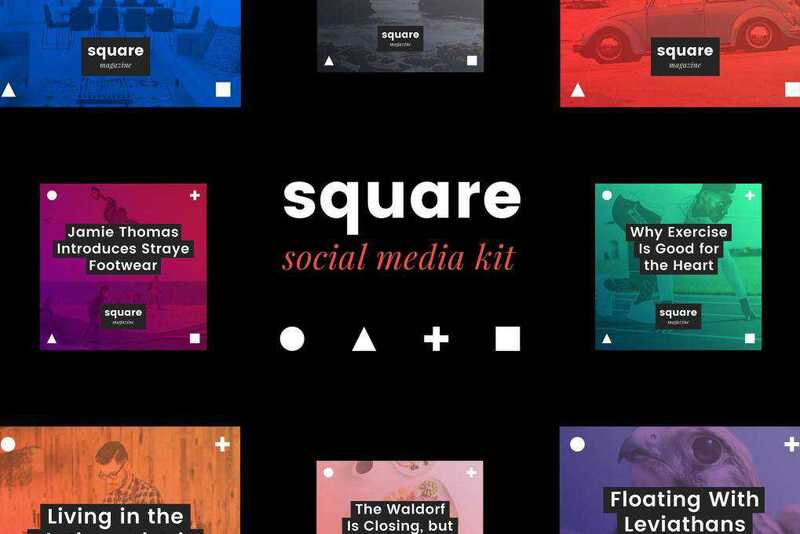 The Square Social Media Kit makes use of gradient overlays to bring attention to your photos. You can customize the overlays to match your brand colors or opt for a simple photo instead. 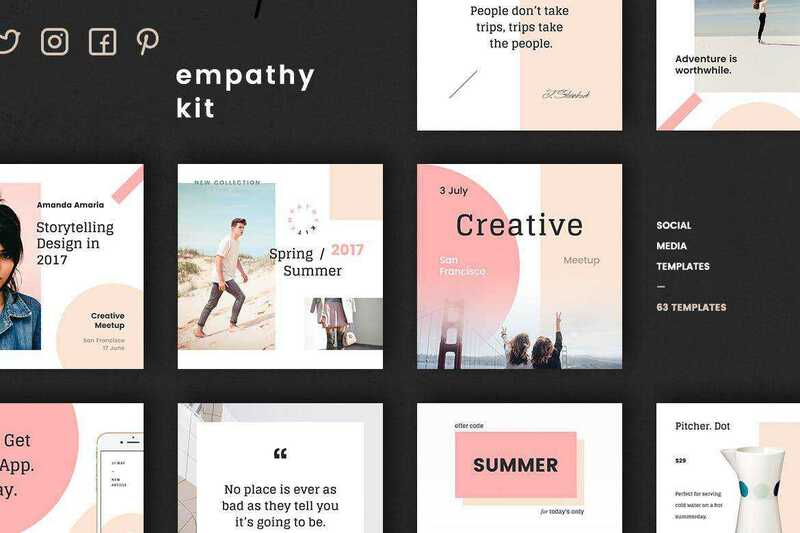 The kit contains 12 templates in a square format that works well on Facebook and Instagram. 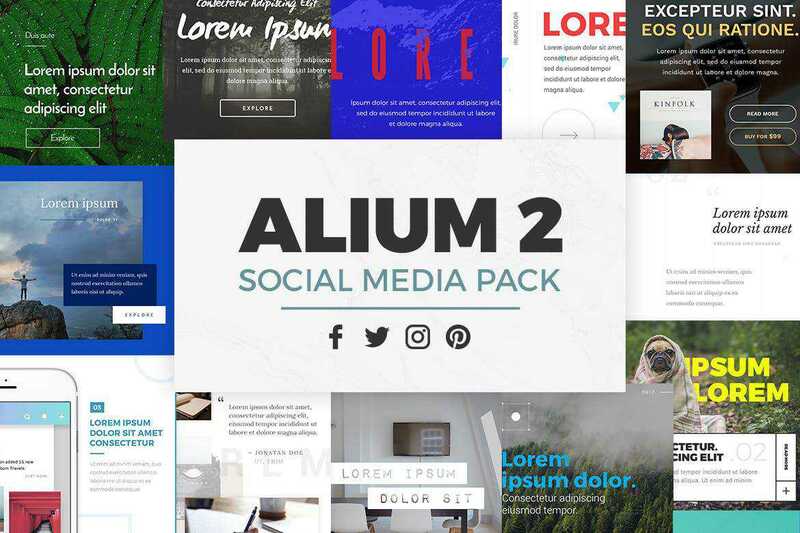 The ALIUM template pack includes 25 multipurpose creative templates in square, horizontal and vertical format. 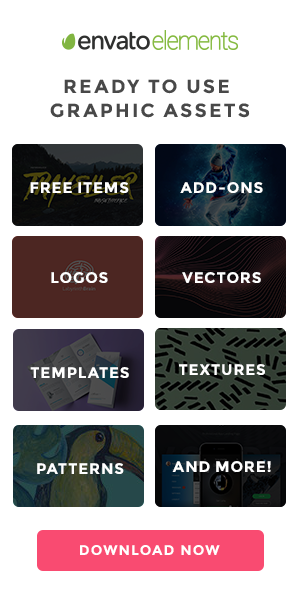 This makes Alium a perfect template pack to be used on Instagram, Facebook, Twitter, and Pinterest. 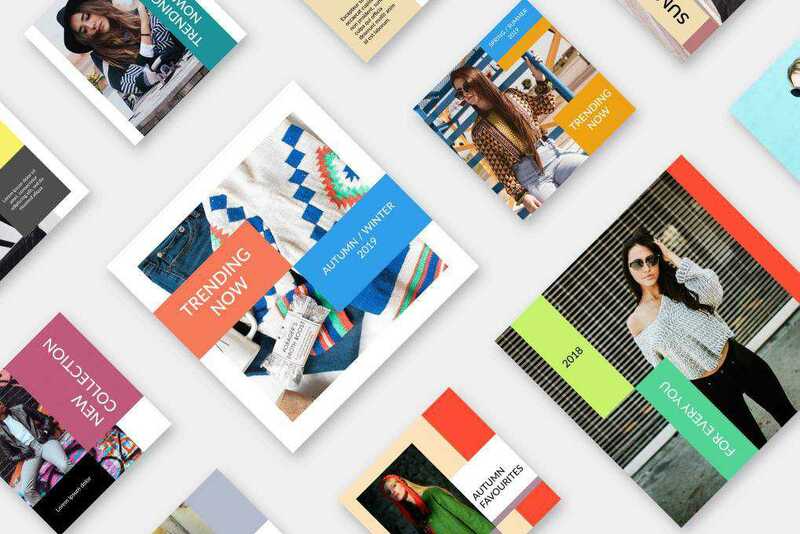 Fashion brands can use this Fashion Social Media Pack to grow their social media following. 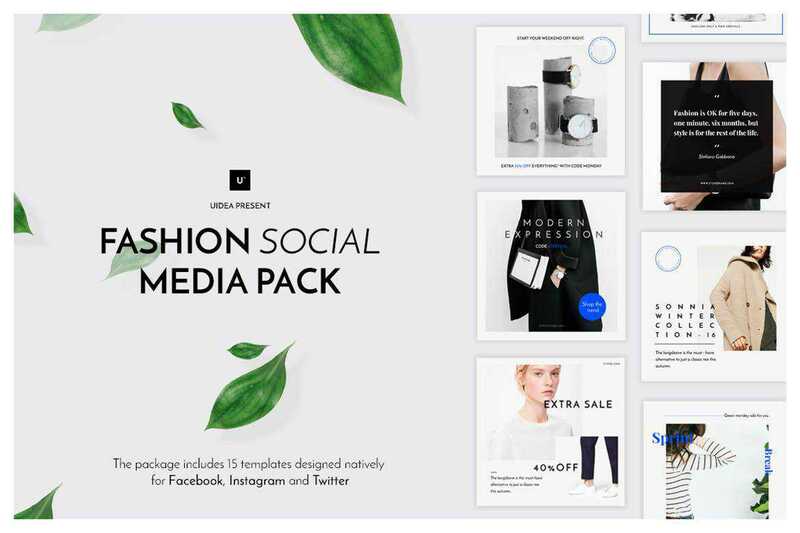 The package includes 15 templates designed for Facebook, Instagram, and Twitter. Each of the templates is easy to edit and customize thanks to Smart Objects. Try this colorful Palette Social Media kit. With 20 different square layouts designed for Instagram, Facebook, and Twitter, this pack is a great choice for a travel or lifestyle brand. 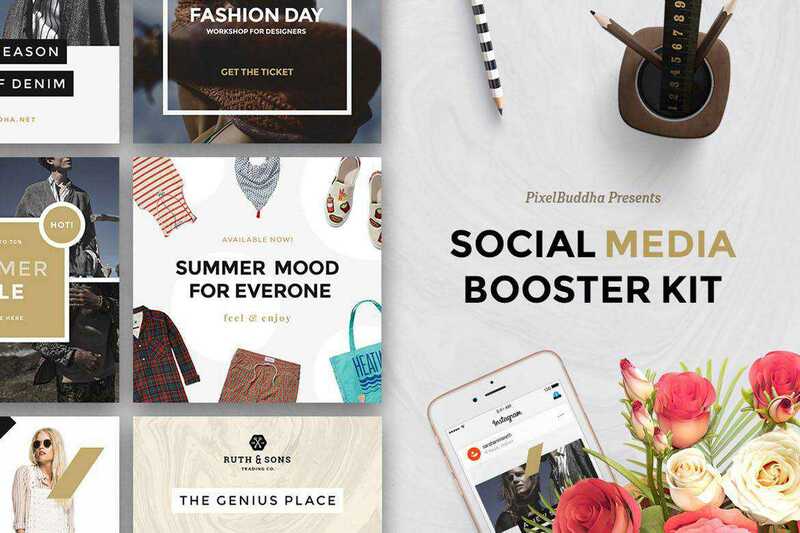 Social Media Booster Kit includes 15 templates designed for Instagram, Twitter, and Facebook. You can easily customize the colors and fonts and replace photos thanks to Smart Objects. This kit is perfect for bloggers, fashion, and lifestyle brands. This social media kit features a modern and bold design that’s bound to make your posts stand out. It comes with 10 different templates designed for Instagram, Facebook, and Twitter. If you’re looking for a more delicate and feminine style, check out the Empathy Social Media Kit. You’ll get access to 21 beautiful templates for Pinterest, Facebook, and Twitter that can be used for quotes, behind-the-scenes photos, announcements, and more. 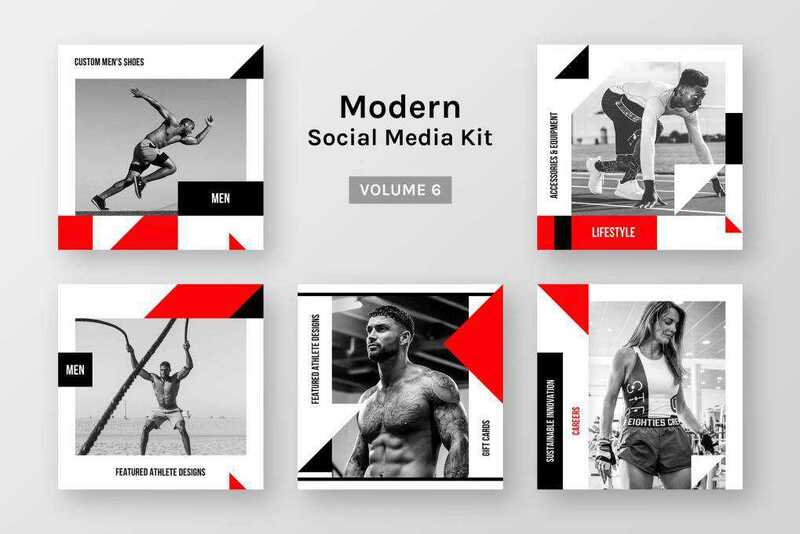 The Modern Social Media Kit features a fresh design and several templates for various purposes such as quotes, announcements, blog post promotions, and more. The templates were designed for Instagram, Facebook, and Twitter. 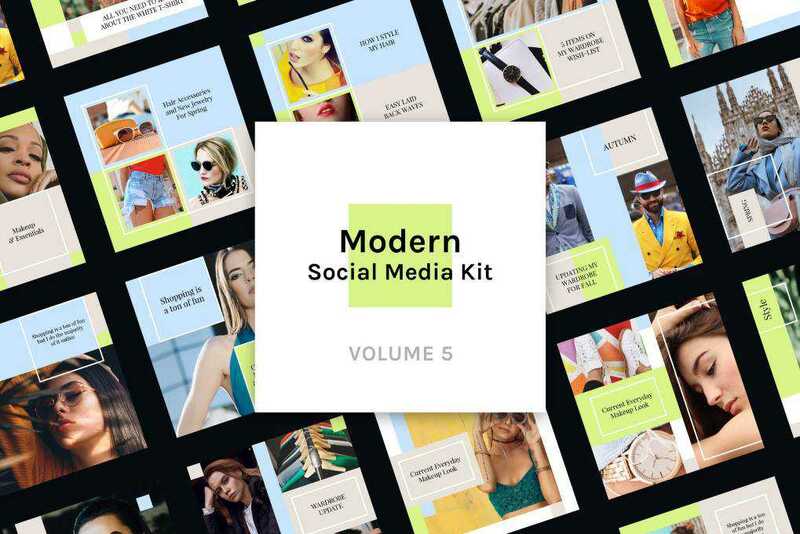 This Modern Social Media kit comes with 20 square layouts that can be used on Facebook, Instagram, and Twitter. You can easily edit the photos through the use of Smart Objects and tweak colors and fonts to match your brand. Posting on social media allows you to engage with your audience and keep them updated with the latest blog posts, announcements, and special offers. 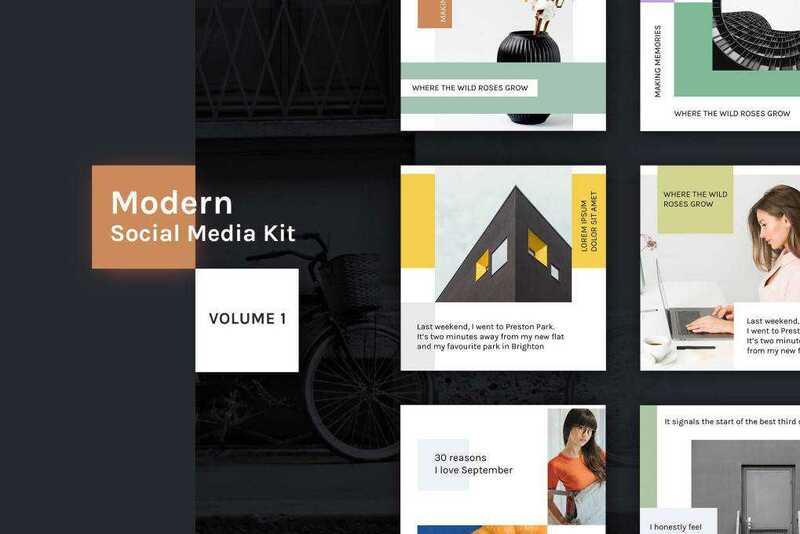 Use these premade social media kits to design social media posts and breathe new life into your social media presence.